For those who are looking for a trip to discover the beautiful underwater marine life and have no idea where to head for, Redang Island located in the state of Terengganu, Malaysia has something unique to offer. The marine life here not only perfect to explore through a diving trip, snorkeling around the house reef would also offer an exciting experience for all ages of visitors. With all the snorkeling equipments, tours and excursions package widely available on the island, your vacation in Redang Island must be fun filled and exciting. 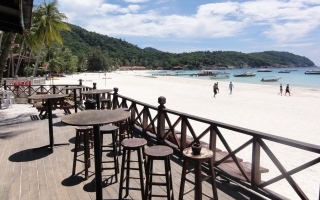 With more than 10 snorkeling spots in Redang, Tanjung Tengah in Pasir Panjang beach homes to one of the busiest and popular house reefs around the island. The southern part is commonly recognized as the ‘Shark Bay’ as the reefs often surrounded by baby black-tip sharks. The perfect time to get close to this shark species is between April and August, not only a few of them but plenty of them wandering around the area. Also inhabitants in this reef are turtles, schooling needlefish, squid, barracuda, orange-striped triggerfish and the other common reef fishes. At the southern part of Pasir Panjang is the Tanjung Mak Cantik. The snorkeling area begins at the beach front of Redang Reef Resort till the resort’s back beach. It is very easy to get into the water and snorkel around the reef from the beach front of the resort. Just get in and swim along the rocky outcrop, you will discover stingrays hiding under the table coral or rocks, some other residents include squid, titan triggerfish, porcupine fish, clams, giant grouper, christmas tree coral and turtles (occasionally). Another crowded and popular snorkeling spot in Redang, the Marine Park Centre is a great place for snorkeling. This marine park in Pulau Pinang is mainly covered with hard corals, with 3-6m deep, snorkelers will find no problem to spot a huge variety of underwater marine life wandering around the artificial reef right beneath the jetty. Moral eel and giant grouper are some of the most popular residents here. 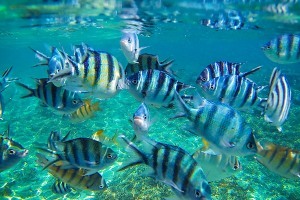 Damselfish, wrasses, sergeant majors, triggerfish and parrotfish all can be easily spotted. If you are lucky, Napolean wrasses and adult blacktip sharks do visit the surrounding area occasionally. Other than these popular snorkeling sites which can be sometime filled full of visitors, house reefs in front of most of the resorts are also perfect for snorkeling. Most of the resorts in Redang do provide snorkeling trips, depending on the type of package that you are looking for, the snorkeling package may includes accommodation, transportation to the snorkeling sites, snorkeling equipments and meals with an all inclusive rate. If you prefer to avoid any hassle that may arise from your own arrangement, such package can be a good option. Also to take note that Redang Island can be crowded and filled with boat load of visitors during peak seasons or local school holidays. 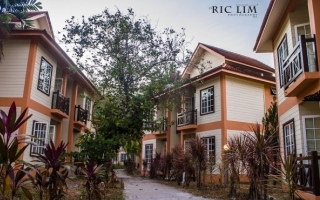 If you plan to include Redang into your travel itinerary during your vacation in Malaysia, reserve the resort in advanced is a must.